Hello all, from Baton Rouge,La..... The Heart of cajun country. New to the sight and to chickens. Well maybe not new, when I was young grandma used to have chickens and me and my brother would help collect eggs sometimes when we would visit but it's been years maybe close to a lifetime ago. let me start by introducing myself. My name is Keith I'm 50 and I am divorced and live by myself in a small community outside of Baton Rouge,La. called Satsuma. it's a rural place and I live in an older subdivision. I live on a half acre. I work 5 days a week at a local refinery in Baton Rouge. 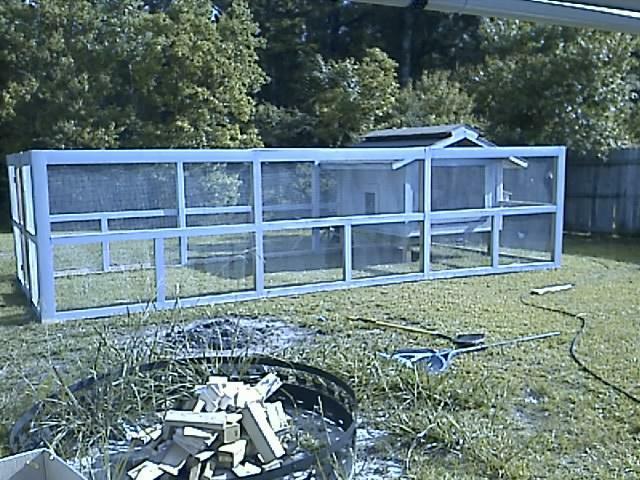 Some of the guy's a work had gotten some chickens to raise for eggs and for fun and hearing them talk I became interested and decided to do it myself. At the end of April I Started to research all about them and I thought this might be fun. I found this website and started looking at coops and runs and trying to decide what I wanted to build. 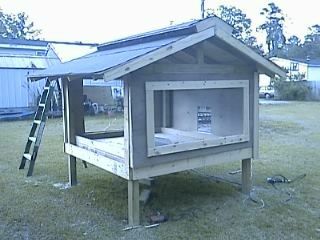 Here in south Louisiana the winters are somewhat mild maybe below freezing a few days at a time at least that's how it's been the past several years and the summers are brutal 98 to 102 quite often so I wanted to build a coop that was well ventilated. I saw one on this site that a fellow Louisiana resident had built and decided I would do a takeoff on that one. I think the guys name is Don B. I made a few changes but used his basic design. His coop is in the small coop section I think. I also put a 10' x 25' run attached to it. on May 2nd I made my first of many trips to home depot to buy the materials. It might look like overkill but I do live in Hurricane ally. It's been a little more than three weeks of working on it most every day when I get home from work and most all day Saturday and Sunday on the weekends. I'm doing it all myself so I can feel some sense of accomplishment on my part. It's a slow process... cut a board ,put it up, stand back and look and think what I want to do next. There are no plans so this is how I have to do it. I may get my brother to help me string the hardware cloth on the run when I get ready to do that in the next week or two. 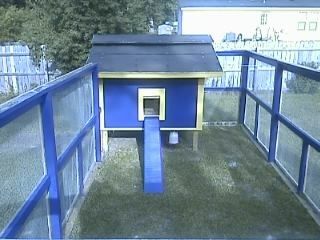 I'm going to paint it purple and gold as I am a big LSU Tiger football and baseball fan ..... Geaux Tigers. It's been an ordeal and I'm still not through yet but I'm close. It's been $1000 in materials not including the compressor and nail guns( I can use these on other projects) I got and I still need to buy the fencing and tin for the roof.The coop is an inch out of square and most of the wood had to be custom cut on every piece I put up but I don't think the chickens can tell and If I hadn't said anything you wouldn't be able to tell from the pictures either. You have to get right up on it in person to tell anything. 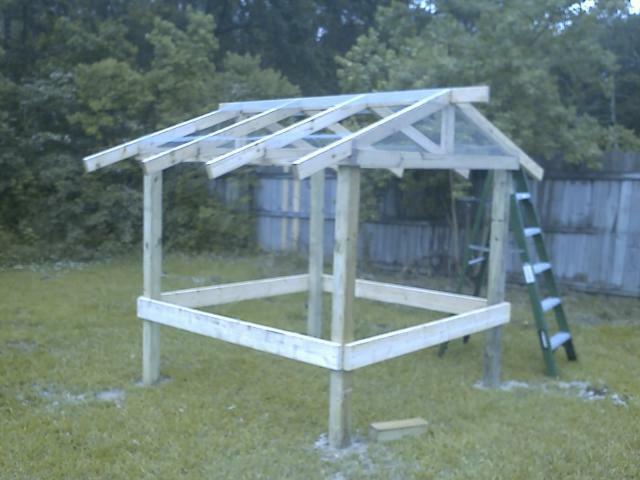 When I got out of high school I went into carpentry and began framing houses for a couple of years until I got a job working for a local utility company and I've been in the plants and refineries ever since. That was 30 years ago and I had to go back that long and try to remember how all of this is done again. 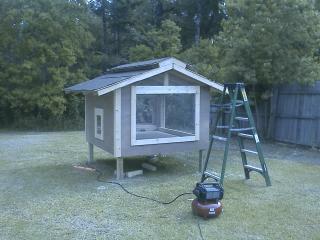 I think I did ok, It's not perfect but it's good enough for a chicken coop. 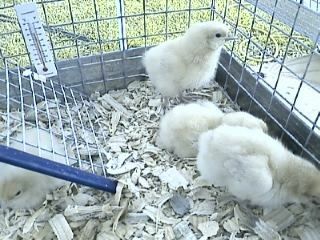 As for chickens I have decided on Buff Orpingtons, I think six will be enough for now. after all I do have nieghbors to deal with. I know I can have chickens because sometimes when I get up before daybreak and go sit on the front porch and drink coffee I hear a couple of roosters crowing a few streets over. So check out what I have accomplished so far. It might be a little overkill but we do live in Hurricane Ally. Sorry for the pic quality I took them with my cell phone. 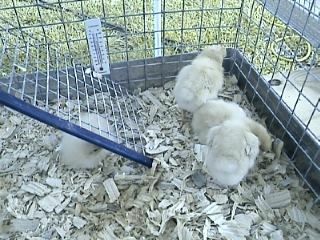 Update ; Went to several of my local farm supply's to get a few chicks and they didn't have any orpingtons. Might be too late in the season around here. I may have to rethink my breed selection. Update #2 : Finally found some Buffs at another local feed store, check out below. Update #3 : One of my Buffs died after only a week and a half. Can not find anymore around here till possibly the fall time. 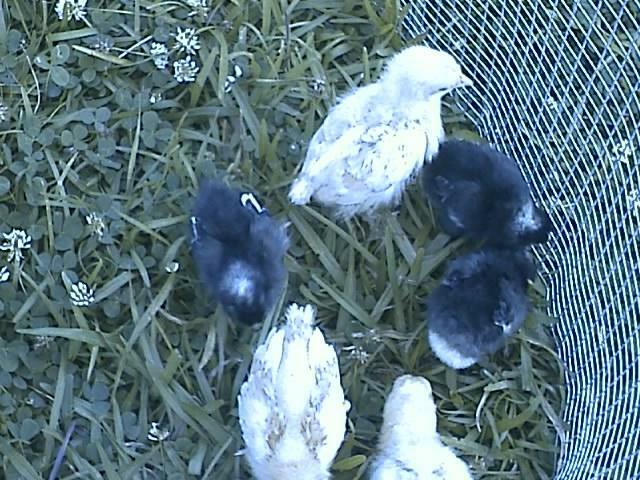 Update #4: I went ahead and decided not to have just orpingtons I went to the Co-op and got three Barred Rock pullets they are about a week old and have intergrated with the buffs just fine. Update#5 : LSU 2009 NCAA National Champs College World Series....GeauxTigers. cubicles, but for now 3 will be blocked off. Piano hinges are used for nest access. Padlocks will the opening in the front. from the chickens and eggs. has been 100` and higher with the heat index. Cryss, DragonflyBayou and hempsteadjb like this. "Basic progress pics - how's the ventilation?" Love that your aim was a well ventilated coop! Did you accomplish your goal? 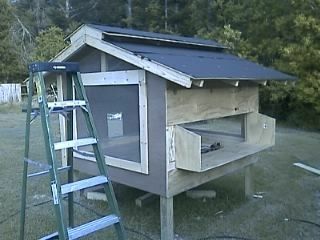 "Great coop with big run"
This coop is well made and the builder put a lot of thought into his design. It has a huge run and there are good pictures of the outside but it would help to see inside better. I am inspired by your post. 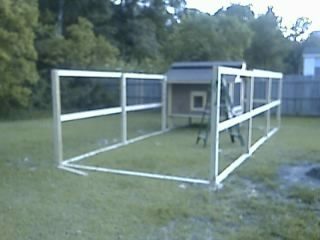 I have NO skill what so ever (having never built anything), but I'm going to build a coop. Thanks for the information regarding weather, etc. I also live in SE Louisiana and these are things I need to consider as well. Your coop looks great. How tall is your run? Do you plan to cover the top of the run? 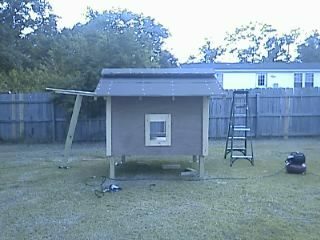 We also built a coop with a peaked roof. 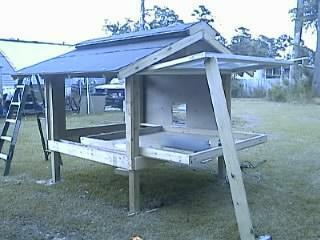 The design was for a movable coop but it's so heavy that we are going to make it permanent. 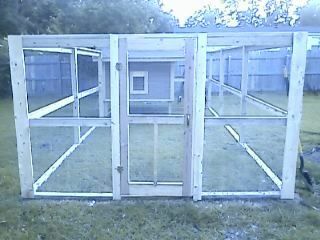 Adding a run to fit under the roof while raising the coop high enough to clean comfortably has me stumped. At least temporarily. 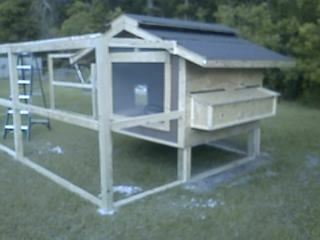 Our coop has no square corners but it's sturdy and the chooks like it so it's all good. Buff Orps and Barred Rocks are two great types of chickens. You'll enjoy them.